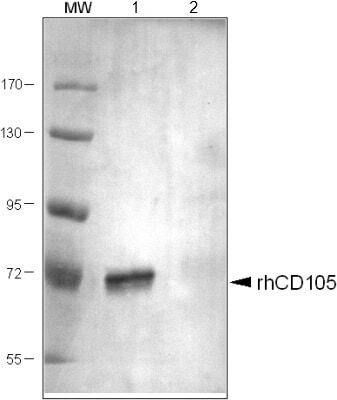 Highly pure recombinant mouse soluble CD105 (aas 26-581) bearing His 6 C-terminal tag. Lyophilised:The lyophilized IgG is stable at 4°C for at least six months and for greater than a year when kept at –20°C. When reconstituted in sterile water/PBS to a concentration of >0.5 mg/ml the antibody is stable for at least six weeks at 2-4°C. Avoid repeated freeze-thaw cycles. Our Abpromise guarantee covers the use of ab21222 in the following tested applications. Publishing research using ab21222? Please let us know so that we can cite the reference in this datasheet. There are currently no Customer reviews or Questions for ab21222.